Nowadays, when you want to buy window Drapes in Toronto, all you need to do is to go to the appropriate online website or e-commerce store. You can buy some really unique, beautiful and the best pieces online. However, the fact remains that you’ll need to make the purchase keeping in mind your window’s measurements. Now, you may be thinking that measuring a window is exceptionally tough. While it is challenging, it is not exactly impossible even for a beginner. For measuring, you’ll need a measuring tape, a paper pad and either a pen or a pencil. What kind of curtain do you want? 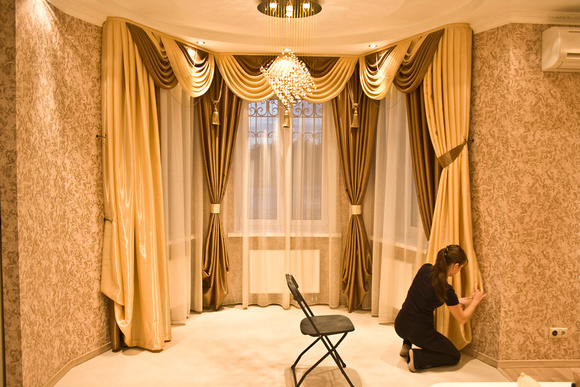 1) Do you want formal Drapes in Toronto or informal curtains? 2) Do you want the drapes to hang slightly below the window’s opening for style or fashion? For best results, you need to measure 2 to 4 inches from the bottom of the window itself. 3) Do you want the drapes to be long enough to touch the floor? You need to measure the distance from the rod to the floor. 4) Do you want the Drapes in Toronto to hand from the ceiling to the floor? Measure from a few inches below the ceiling to the floor. Before ordering the window Drapes in Toronto, it is best to install a curtain rod first. This will also give you a fixed idea of where the drapes shall hang from. You should hang the rods 6 inches above the frame. The rods also need to reach 2 to 3 inches on either side of the window. If you are confused about all this, ask the local furnishing guy. Width always needs to be measured first. Use the measuring tape and record the road’s width. Start from one tip and end at the other one. This is done even by the professionals so that you don’t make a mistake by measure the decorative areas of the rod. If you know that the drapes have extensive folds, take the measurement of the width and multiply it by two. This is comparatively easier. To know the height, start measuring from the below the clip or the ring and all the way down to the distance to where you want the drape to hang from. Now, it may happen that you don’t have curtain rods and this creates a considerable problem. But fret not yet! If this is the case, measure the width by noting the dimensions of the window’s inside space. For height, note the height from 6 inches above the frame to the desired length.